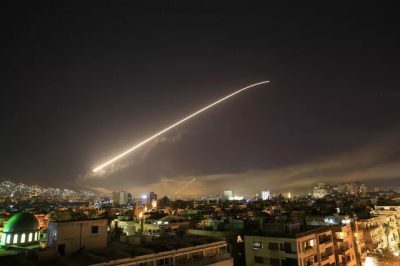 Does It Matter that the Strikes Against Syria Violate International Law? The air strikes in Syria by the US, UK and France after suspected chemical weapon attacks on civilians violate the UN Charter and international law - but does it matter? Leading legal experts and former US officials have almost universally stated that the recent airstrikes in Syria carried out by the United States, France, and the UK – three permanent members of the United Nations – were illegal under international law. This even includes a former top legal official in the Bush administration. Yet, these types of attacks have garnered strong support from governments around the world. Additionally, strikes like this appear likely to happen again: the United States has stated that it is “locked and loaded” to strike Syria again in response to further chemical attacks. Countries have selectively ignored international law constraints on the use of force at different points in history. In fact, a famous 1970 article described the “demise” of international law norms against the use of force. But should we be concerned about this ongoing discrepancy between the use of force and international law? And what is at stake here? There are only two limited circumstances when a state can lawfully use force: (1) with the permission of the UN Security Council or (2) in self-defense. In this case, the attack on Syria does not fit either circumstance. First, the United Nations Security Council did not approve the strike. Second, this was not clearly self defence. Instead, the most common justification for the strike has been an attempt to deter Syria’s use of chemical weapons in the future. Second, the United Kingdom’s justification – the “humanitarian use of force” – also fails. This justification relies on three prongs. First, there must be “convincing evidence, generally accepted by the international community as a whole” of extreme humanitarian distress. It must also be “objectively clear” that there is no practicable alternative to the use of force if lives are to be saved. And finally, proposed use of force must be necessary and proportionate to the aim of relief of humanitarian suffering and must be strictly limited in time and in scope to this aim. This argument also does not work. On its own terms, this justification does not seem to apply to the current situation. If we look at the first prong, it is not clear that the “international community as a whole” has accepted that there is convincing evidence of an attack since both Russia and China have argued that more investigation and dialogue are necessary before any action is taken. Regarding the second prong, the speed by which the strikes were carried out at least brings into question whether there is no other practicable way to save lives. In fact, the strikes were carried out on the morning of the day that inspectors were due to begin their investigation. Secondly, even if these prongs were satisfied, there are only two countries that have recognised a right of humanitarian intervention – the UK and Denmark. It therefore does not render any attack legal. Despite this clear illegality, many of the richest and most powerful countries in the world have supported the attack. This includes all members of the North Atlantic Treaty Organization (NATO), as well as Israel and Japan. Most have voiced this support by arguing that, with a deadlocked UN Security Council, the only effective way to deter the future use of chemical weapons is through the limited use of force that punishes a state for using such weapons against its citizens. But this is not a legal argument, and according to some legal experts, the language has the flavour of armed reprisals which is clearly unlawful. All that is left really of this argument is that the attacks are “illegal but legitimate.” But if “illegal but legitimate” becomes an accepted principle, then the Charter’s limits, at least on the use of force, become meaningless. So, how should we respond to this gap between the use of force and the international law regulating it? One option is to continue to disregard international law and justify the illegal use of force in the language of morality. This would essentially continue the status quo approach and further the slow degradation of Article 2(4)’s prohibition against the use of force in the international legal system. This approach might be well-intentioned but would come with considerable cost. International law – without a centralised institutional mechanism for enforcement – already faces significant problems of enforcement. The less respect countries pay to the letter of international law on the use of force – particularly Western countries – the more likely it is that other countries themselves will not choose to follow it. In fact, it becomes far harder – if not impossible – for the United States, the UK, and France to condemn the use of force by other countries when they themselves grossly flaunt it. So if we care at all about the “rules-based order”, we should worry about ignoring international law constraints on the use of force. Otherwise we are admitting that international legal regime on the use of force has completely broken down. A better way to respond is to recommit to international law by seeking to engage with and introduce changes in the use of force. Change like this requires two things. First, it requires Western states using force to make legal arguments about its basis outside the established exceptions. It would mean that States must abandon their extralegal moral arguments grounded in concepts of deterrence and more explicitly engage in the language of international legality. This is the only way to possibly begin to create a new rule of customary international law. Second, it requires the involvement (or at least acquiescence) of the two key permanent members of the UN Security Council: Russia and China. To get these countries on board would more than likely require a diplomatic approach meant to restore trust in the use of force. In the wake of recent interventions in Iraq, Yugoslavia, and Libya, this is an uphill battle. For Western states, it would require clear statements and qualifying language that any additional international law norm justifying the “humanitarian use of force” is not aimed at regime change (as these countries suspect). Instead, this additional exception would only legally authorise the highly limited and targeted use of force in response to gross violations of humanitarian law. Additionally, it would also require Russia and China to admit that some of their allies are engaged in heinous practices which deserve no defence. The fact that this kind of engagement seems unlikely says more about the attitude of leaders in Western capitals to international law and the difficulties (and potential compromises of) traditional diplomacy than it does about the possibility of reform. But to fail to attempt engagement like this would be to allow a key linchpin of the rule-based-order – its prohibitions on the use of force – to continue to weaken. Surely, this is good enough of a reason to recommit to a policy of engagement with international law on the use of force? Prof. William Partlett is an Associate Professor at the Melbourne Law School, University of Melbourne.